About a month ago I started thinking about ways to vary STEM Challenges! How could I increase engagement and is that even possible with highly-engaging STEM challenges? We seemed to be in a build it frenzy and I really wanted to concentrate on covering science standards, while still having fun, and complete some design projects, too. In this post, for your convenience, you may find Amazon Affiliate links, which means Amazon passes tiny amounts on to me- if you purchase something through that link, at no extra cost to you. This helps keep this little blog running! What is a STEM Quest? Some folks call these Lock Boxes or Unlock Boxes, Escape Events, or Find the Code. I have seen all these terms used. Basically, students solve problems to find clues and then use the clues to determine how to unlock some locks! Anyway, first I needed some boxes. I went to a local hardware store and discovered that toolboxes cost a small fortune. Then I accidentally stumbled upon plastic tool boxes at DOLLAR TREE! I promise you could hear me shouting when I found them! I needed three so 3 bucks was fantastic. Then I needed locks. I found combination locks back at the hardware store and grabbed three. That was about $20, but we will use these over and over, so it was a good investment. That is the exact lock I have. The little silver wheels roll and you can see the numbers on the end. Kids can open these! Best of all, the hasp will fit my dollar store tool boxes! Click on the link if you need to see it up close! What are the Quest subjects? Well, when I started working on our first Quest, I took a close look at our state science standards and used a fifth grade standard about space, then a fourth and fifth grade standard about landforms, then another about the human body. The latest one is about spiders! So, the Quests are science-based and for where I live they are based on our state standards! Win-win! What do the kids do? This has been the really fun part! Take a look at the Spider Quest and you can see some of the ideas! Here are kids sorting facts about spiders and insects. Each strip has an alphabet letter on it and if they sort correctly they can unscramble the letters to spell a word. That word leads to a spider display and a clue- which leads to determining the lock code. Open the box to get your next task! Above you see kids locating spiders on a coordinated grid. They move the spiders according to a directions card. In the end, they determine a specific spider which leads to a display which leads to a clue and the lock code. Unlock the box and get your next task! The kids above are completing math problems to solve a riddle which... you guessed it. It leads to a clue and the lock code. Kids race all over the room to find the clues and try the locks. They have to read, follow directions, be very observant, and THINK! I placed some of the items for the next task in the locked box. When kids opened the box they grabbed the bag of materials and raced back to read directions and do the task. For some of the tasks, we placed the next items in a tray beside the locked box. When the box is opened, a card inside tells kids to grab the task from the tray and off they go to solve it! Is there a STEM Challenge? YES! 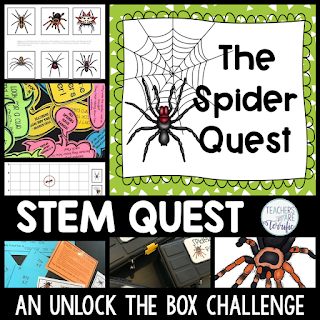 In the Spider Quest (and the Skeleton Quest) the ending portion of the project is a design challenge. With both of those Quests students "earn" their materials based on getting the boxes open. Open the boxes first and your team gets more materials! This was so much fun! Kids had to build a spider cage for 10 spiders with a list of constraints to follow. Above you see the materials bins lined up and ready for groups to grab. When the team opened that last box they grabbed the next bin in line and got started. Don't worry, the spiders were not real. I used plastic spiders from a dollar store. These were actually rings and we cut off the ring part. The kids did the cutting and it was actually their idea. They told me the ring part took up too much space in their cages. This is a pack of 144 and they will work perfectly! The cages had to have a viewing window. You will love how I solved that! I thought about waxed paper or plastic wrap. Then I was laminating some things at school, so of course, I saved the extra laminating film that is at the end of your set. I just cut it into little squares and every team got a piece for their window. Above is a finished cage with its window and carrying handle. Looks like happy spiders inside! Here are two more finished cages. Notice the latch that is closing the black cage. It's made from folded construction paper. That latch will definitely keep those spiders from escaping! What if you don't want to buy locks? I included a set of "paper locks" in the resource. Just copy them and kids fill in circles to "open" the lock. They can have you look at it and then open the box or you can use a keyed lock and give them the key. Do you have to use a toolbox? NO! I tried my locks with a cardboard box. I punched holes the box flaps and threaded the lock hasp through each side and it worked fine! Isn't this a lot of work to set up? It took me about 40 minutes to print, laminate, and cut all the pieces. Setting up the spider displays took less than 30 minutes. The best news is this: I saved everything. The next time I use the Spider Quest all I have to do is open the large zippered bag it is stored in and set up the displays. What does this look like in the classroom? Total excitement, that's what. The kids have loved this. They race around to the displays and talk so much about how to use the clues and they work together SO WELL! How long does it take? The Quest takes 30-45 minutes and the challenge is the same. My fourth graders take longer. But, here's another thing- the second Quest we completed went faster. The kids got better at opening the locks and also with finding clues. They learned quickly. "This is like being a detective!" "I love these more than just building things." "I came to school today hoping we were doing a locked box thing!" Thank you so much for sticking with this post all the way to the end. I hope you are convinced that a Quest is for you! I have several in my Teachers Pay Teachers store now. They are for 4th - 6th grade. Third-grade versions are on my to-do list! Please Pardon Our Mess! This is Learning in Progress! Satellite Dish Towers for the Win! Five Excellent Ways to Decorate for Science!